When I had to idea to create some finger puppets out of pipe cleaners, little did I realize what creativity I would unleash in my children. 3 packages of pipe cleaners later, I have enough different finger puppet ideas for probably 10 more posts! 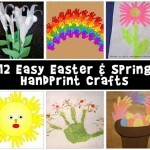 I had no idea these would be such easy crafts for kids. Pipe cleaners are extremely forgiving and deceptively easy to work with. Anything you ‘mess up’ while bending them is fixable. And by using a hot glue gun, you are pretty much unlimited in how you can attach eyes, limbs, and embellishments. Step 1 is to take the pipe cleaner and wrap it around your finger. I like to do it rather tightly, because once it is off of your finger, it is easier to stretch it out than it is to tighten it up. 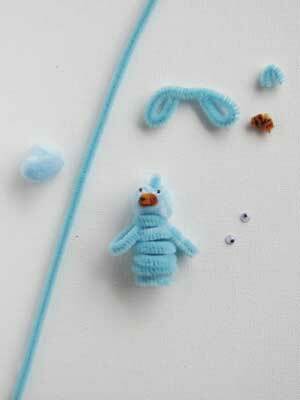 Here are the pieces of each of the pipe cleaner finger puppets shown above. I was skeptical whether the hot glue would work on some of these pieces, but it worked perfectly. 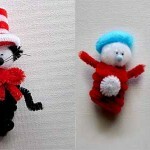 Just put a tiny dab of glue onto the wire end of the pipe cleaner and stick it straight down into the pom pom – it will stick after just a second or two of holding it in place. After gluing the white head onto the pipe cleaner body, stick a dab of glue onto both wire ends on one of the bent pipe cleaner ears. Stick them firmly into the pom pom while squeezing the ends together. Glue two tiny white pom poms on the face as a base to stick the googly eyes. This is really optional, and you can see on the kitten finger puppet below that you can also just glue the googly eyes directly onto the pom pom head. Then glue on the pink nose and the medium sized pink pom pom for the tail. After gluing the white head onto the pipe cleaner body, clip a tiny piece of orange pipe cleaner and bend it into a V shape, and glue it onto the middle of the face. Glue the two yellow mini pom poms right above the beak to make a base for the googly eyes, then glue them on top of them. 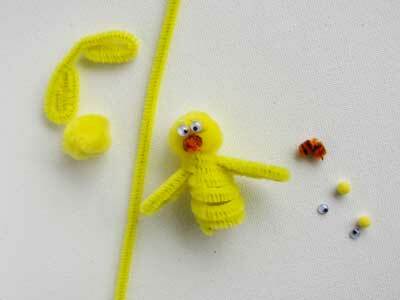 Take about a 4 inch piece of extra yellow pipe cleaner and bend it into the wing shape as shown. You don’t even need to glue these in, just slip them onto the body in between the coils and they will stay put. 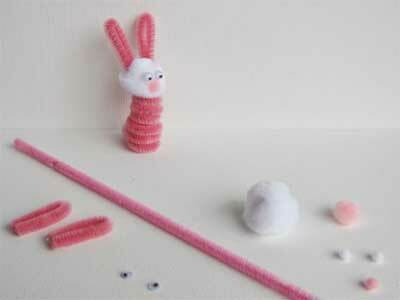 After gluing the white head onto the pipe cleaner body, clip two small pieces of white pipe cleaner (about 3/4″ long) and bend them into a V. Glue them onto the top of the head. I skipped the extra tiny pom pom eye base on this one, wanting to go for a more “Hello Kitty” look. You only need one tiny pink pom pom for the nose, but here’s a little tip: if you don’t have a tiny pom pom to use, you can clip a tiny piece of pink pipe cleaner (less than 1/4″ long) and glue it onto the face instead. 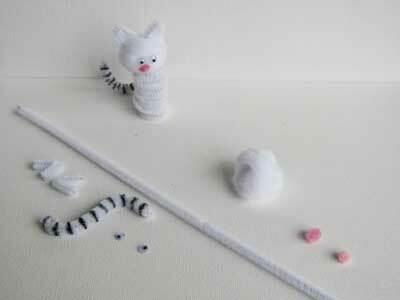 The tail is attached by bending it onto the bottom coil on the back of the kitten’s pipe cleaner body. To make this variance on the Easter chick, I omitted the mini pom pom base for the eyes, and added a little tuft of feathers on the top of the head the same way I did the kitten’s ears (but only added one and put it on lengthwise instead of sideways). The wings are also a slightly simpler version of the yellow wings, and might be easier for smaller children to bend on their own. 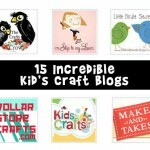 Pingback: Friday Finds | kiddio | kids. craft. life. I saw these Easter puppets and fell in love! They are adorable! 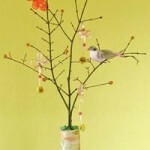 I would like to invite you to contribute this craft project to FaveCrafts. All the details of your authorship are preserved. We love to feature fresh voices on our website constantly and nurture such a vibrant, creative community of crafters. Just wanted to let you know that we made your puppets and LOVED them. So much fun. these are SOO CUTE!!!!!!!! I absolutley love the kitten and the easter bunny! Hi there! 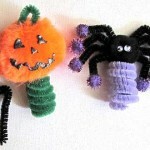 I absolutely love these finger puppets ~ my daughter passed away in August 2010 and I am always looking for seasonal ideas to decorate her cemetery site with. 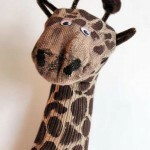 By gluing a popsicle or wooden stick to the inside of this puppet (where you would normally put your finger), these can easily go into the ground. I just love them – thank you!! Hi! Wanted to stop by and let you know we loved making your puppets. Thanks for the tutorial! i tried this craft and the bunnies are SO cute!!! the only thing i messed up on was that i was a little messy with the hotgue gun and one of my bunnies had a glue all over him!! after i made the bunnies i decided i would give it a try on popcicle sticks. so i basicly did the exact same thing except they are no longer finger puppets but props for plays, they turned out awesome! befor i thought the cats were misssing something but i figured it out and i found some extra wire laying around the house and thought i would give the cats some wiskers, now they look much more like kittys.